HANEY! STRYDOM! de MEY! PARIS! BENAZIZA! GASPARI! 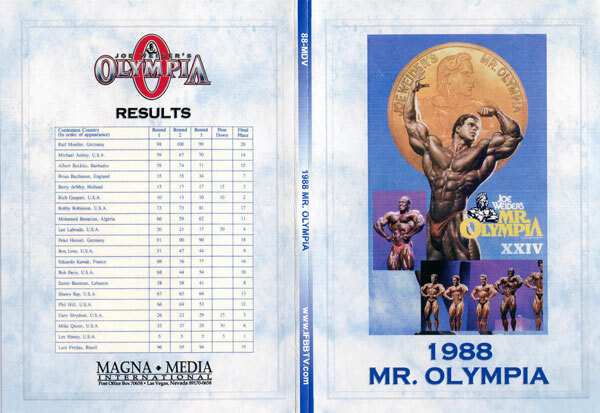 The competitors were Lee Haney (1) with a perfect score, Rich Gaspari (2), Berry de Mey (3), Lee Labrada (4), Gary Strydom (5), Mike Quinn (6), Brian Buchanon (7), Samir Bannout (8), Ron Love (9), Bob Paris (10), Mohamed Benaziza (11), Phil Hill (12), Shawn Ray (13), Michael Ashley (14), Albert Beckles (15), Eduardo Kawak (16), Robby Robinson (17), Peter Hensel (18), Luiz Freitas (19), Ralf Moeller (20). This is an authorized and licensed copy made directly from the broadcast-quality master tape. It does not come with the original video cover information. I have recently learned from Berry de Mey that this is the correct way to write his name. He is variously listed on our GMV site as Berry DeMey, Berry De Mey or Berry deMey. The correct spelling of Berry de Mey will now be used in future.